8. Glossopterid plant remains in permineralization: What do they tell us? 10. A Triassic Mystery Solved: Fertile Pekinopteris from the Triassic of North Carolina, U.S.A.
11. Enigmatic, structurally preserved stems from the Triassic of central Europe: A fern or not a fern? 17. Fossil seeds with affinities to Austrobaileyales and Nymphaeales from the Early Cretaceous (early to middle Albian) of Virginia and Maryland, U.S.A: new evidence for extensive extinction near the base of the angiosperm tree. 26. Functional significance of cambial development in Vertebraria roots: How do unusual xylem traits serve life at a high latitude? Michael Krings is curator for fossil plants at the Bavarian State Collection for Palaeontology and Geology (SNSB-BSPG) in Munich, Germany, and professor of plant paleobiology at the Ludwig-Maximilians-Universität Munich. He also holds an affiliate faculty position in the Department of Ecology and Evolutionary Biology at the University of Kansas. He received his PhD in botany from the University of Münster, Germany, and was an Alexander von Humboldt-Foundation postdoctoral fellow at the University of Kansas. His research interests include Carboniferous, Permian, and Triassic seed plants and the biology and ecology of microorganisms in late Paleozoic terrestrial ecosystems. Carla J. Harper is an Alexander von Humboldt-Foundation postdoctoral research fellow at the Bavarian State Collection for Palaeontology and Geology (SNSB-BSPG) and Ludwig- Maximilians-Universität Munich, Germany. She also holds a research associate position at the Biodiversity Institute and Natural History Museum at the University of Kansas. She received her Ph.D. in ecology and evolutionary biology from the University of Kansas. Her research interests include the biology and ecology of microorganisms and biotas in Permian–Jurassic ecosystems of Antarctica and late Paleozoic of Europe, symbiotic systems through time, as well as the biology, geochemistry, and evolution of fossil microbes. with their systematics, paleoecology, bio-chronostratigraphy and paleoclimatology. Gar Rothwell is the Edwin and Ruth Kennedy Distinguished Professor of Environmental and Plant Biology, Emeritus, Ohio University, and Courtesy Professor of Botany and Plant Pathology, Oregon State University. 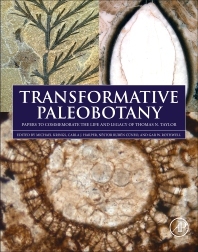 He is past-president of the International Organisation of Palaeobotany, author of the paleobotany textbook, Paleobotany and the Evolution of Plants (Stewart and Rothwell, 1993), and editor of six previous volumes of studies in plant paleontology. His research focuses on the role of development in evolution, and on the patterns of organismal evolution and phylogeny among land plants, particularly lycophytes, equisetophytes, ferns, and seed plants.